The suction-cupped alerts that stuck to a car’s rear or side windows were originally designed to notify surrounding traffic that an infant was in their midst, the idea being that drivers would either slow down or take note that a fatigued or distracted parent was operating a motor vehicle ahead of them. In the summer of 1985, barely a year after its debut, the Baby on Board sign had been affixed to more than 3 million cars, with 500,000 being sold each month. Once Bradlees began carrying it, other stores like Sears and Toys "R" Us followed suit—and by 1986, the distinctive yellow signs had become as common as a spare tire. While Lerner was profiting handsomely, he was seeing only a fraction of the car sign industry's total revenue. Once Baby on Board caught on, it became easy for companies to manufacture parody replicas: Baby Driving, Grandma on Board, Ex-Husband in Trunk, and Illiterate on Bord were all snapped up by more cynical drivers who felt the original sign was silly to suggest they'd be driving aggressively if not for the warning. At one point, the knock-offs outnumbered Lerner’s sign by five to one on roads in the New York metropolitan area. 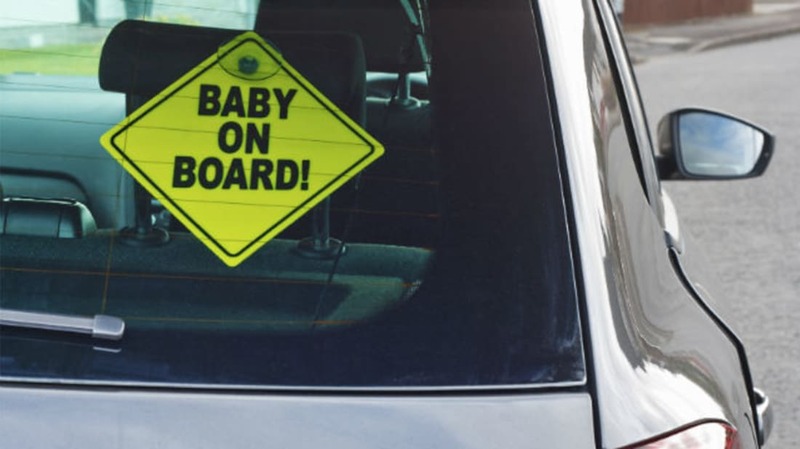 Lerner dismissed the phantom-baby stigma, insisting the sign was designed to be removed when the infant was absent and felt it contributed to more responsible driving. While it was impossible to discern whether it actually made a difference, the parodies certainly did: Baby Carries No Cash and other jokes helped contribute to window decal fatigue, prompting Safety 1st to focus on other products like bath seats and door signs that could tell solicitors a baby was asleep inside. In 2000, Lerner sold the company to Dorel for $38 million. In 2014, the owners estimated more than 10 million signs had been sold.